Reaper Girl, a novelette originally published in Under Her Protection: Stories of Women to the Rescue, centers around a Grim Reaper named Leliel and Rick, the man whose soul she reaps by accident. She must fight the Underworld (and him, at times) to get it back. 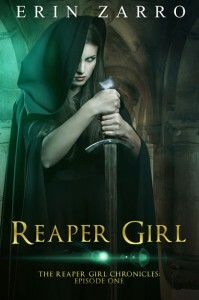 Episode One of the Reaper Girl Chronicles. FREE when you subscribe to my newsletter. In Flames, my first flash fiction collection – FREE. This flash fiction collection – my first – consists of six flash fiction stories, as well as an exclusive four-chapter excerpt of my debut novel, Fey Touched, book 1 of the Fey Touched series. Blindsight – A cancer patient takes an experimental treatment, but the side effect is horrific…or is it? 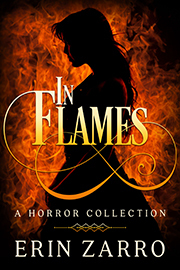 In Flames – A pissed off angel sentences everyone to hell, but refuses to see the truth. The Beautiful Woman -A deformed man is suddenly attractive but the woman he wants isn’t what she seems. The Last Kill – A rehabilitated murderer faces madness when her victims become voices in her head. Sun Touched at Turtleduck Press – a free serial set in the Fey Touched world. Part 1. Ever Touched Teaser at Turtleduck Press – Excerpt of book #3 of my Fey Touched series, Ever Touched. Spiritus Viri at Turtleduck Press – Since getting married, some awful things have happened to Liz and Jerry. A horror short. Changeling: Part 5: The Faerie Escape at Turtleduck Press. Conclusion to Changelng serial. Changeling: Part 4: The Faerie Portal at Turtleduck Press. Maria discovers that there is a portal that can take her back to her human family. Changeling: Part 3: The Faerie Shadow at Turtleduck Press. Maria discovers she has a shadow, and is devastated when she discovers the truth of who she is. Changeling: Part 2: The Faerie Dance at Turtleduck Press. Something strange happens to Maria while she is dancing at a faerie revel. Changeling – Part 1: The Faerie Lights at Turtleduck Press. Maria accidentally finds a portal into Faerie and discovers something that turns her life upside down. A fantasy serial. Warped at Turtleduck Press. Something odd is happening at Andi’s new job. A horror short story. The Penitent at Turtleduck Press. A supernatural flash story about a former nun who must commit horrible things to prove her loyalty to her demon Master. Fey Touched Teaser at Turtleduck Press – Excerpt of my debut novel, Fey Touched.